Forget delivery and try this Easy Pad Thai Recipe tonight! 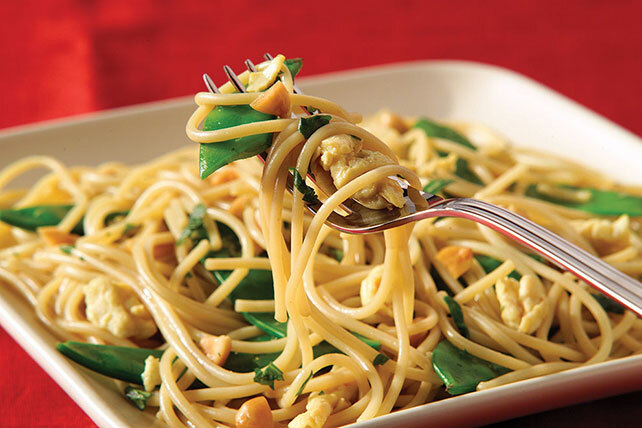 Enjoy this Easy Pad Thai Recipe for a flavorful weeknight dish. Keep the tip money to yourself! Cook spaghetti in large saucepan as directed on package. Meanwhile, spray large nonstick skillet with cooking spray; heat on medium-high heat. Lightly beat egg whites and whole egg. Add to skillet; cook until eggs are scrambled and set, stirring frequently. Transfer to bowl; cover to keep warm. Add pea pods to skillet; cook 2 to 3 min. or until crisp-tender, stirring frequently. Add teriyaki sauce; cook until heated through, stirring frequently. Drain spaghetti; return to pan. Add pea pod mixture, eggs, nuts and cilantro; mix lightly. Garnish with lime or lemon wedges. Squeeze over each serving for added flavor. Substitute 2 pkg. (6 oz. each) frozen snow peas, thawed, for the fresh snow peas. Substitute 4 sliced green onions for the chopped cilantro.